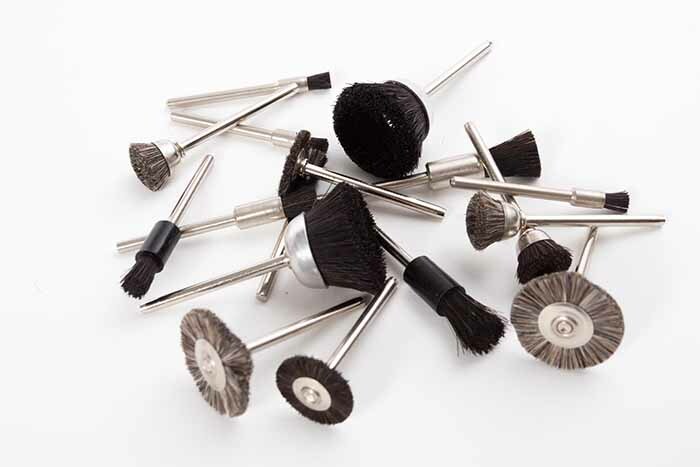 Falcon Tool offers a wide variety of mandrel mounted Miniature End Brushes, Cup Brushes and Wheel Brushes that are of the most durable in the industry. 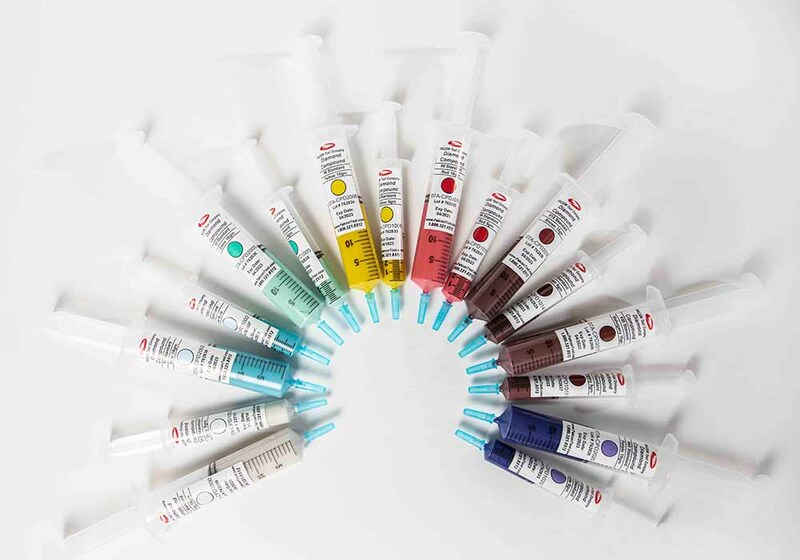 Brush filaments are securely embedded in a steel ring construction offering the highest quality through consistent distribution. 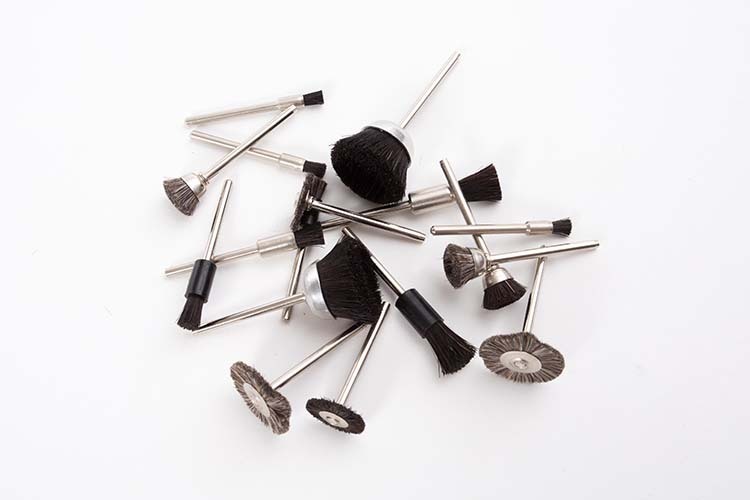 Our Miniature Brushes are great for use with diamond and other compounds. Use with one of our Air or Electric Grinders. All Brushes have a 1/8" Shank. 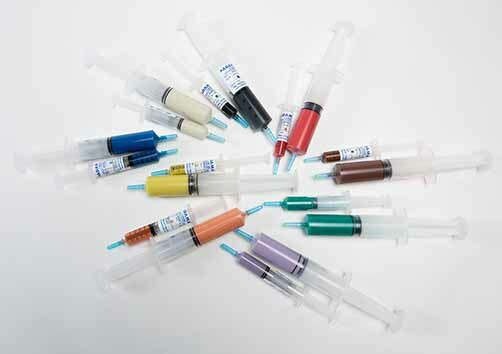 The use of a Plastic Ferrule assists with preventing scratching when used for interior polishing applications. 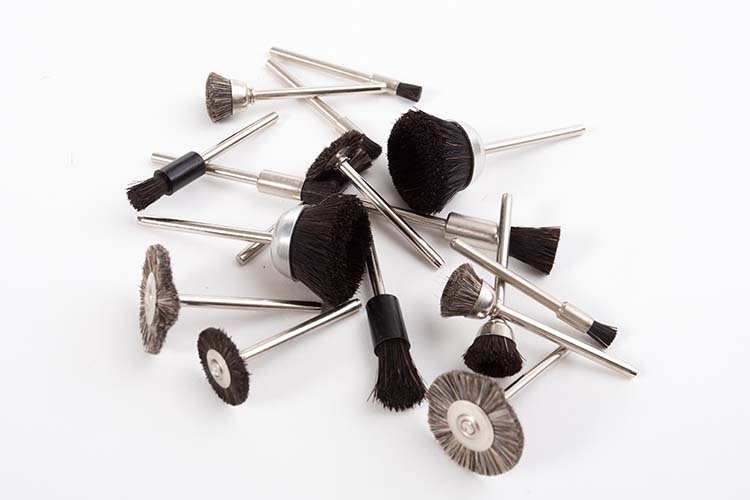 The maximum safe speed for all miniature brushes is 25,000 RPM. Sold in quantities of 12 pieces. Please reference the chart below to choose the appropriate brush type, material and style for your polishing application. Stiff Horsehair with Plastic Ferrule SAP-2 3/16" 1/4"
Soft Goat Hair with Metal Ferrule SG-2 3/16" 1/4"
Brass Wire .003 BW-2B 3/16" 1/4"
Brass Wire .005 BW-7C 1/4" 3/8"
Steel Wire .003 SW-2D 3/16" 1/4"
Stiff Horsehair HC-2 9/16" 1/4"
Soft Goat Hair GC-2 9/16" 1/4"
Brass Wire .003 BW-2 9/16" 1/4"
Brass Wire .005 BW-2A 9/16" 1/4"
Steel Wire .003 SW-2 9/16" 1/4"
Steel Wire .005 SW-2A 9/16" 1/4"
Stiff Horsehair HC-5 3/4" 3/16"
Brass Wire .003 BW-5 3/4" 3/16"
Brass Wire .005 BW-6A 1" 5/16"
Steel Wire .003 SW-5 3/4" 3/16"